This page offers a list of frequently asked questions regarding the Northwestern Bank “People Pay” feature, which you can use to pay another person through your online banking or mobile smartphone. How Much Does People Pay Cost? Nothing. People Pay is a free feature for all Northwestern Bank customers, who either have an online banking login or the SNB Mobile App downloaded to their device. What are the Requirements To Use People Pay? You must have an NWB checking account and be registered for online banking. To use on your mobile device, you must also download the NWB Mobile App. You will need to activate the People Pay feature on your online banking account using a tablet, laptop or desktop computer device. 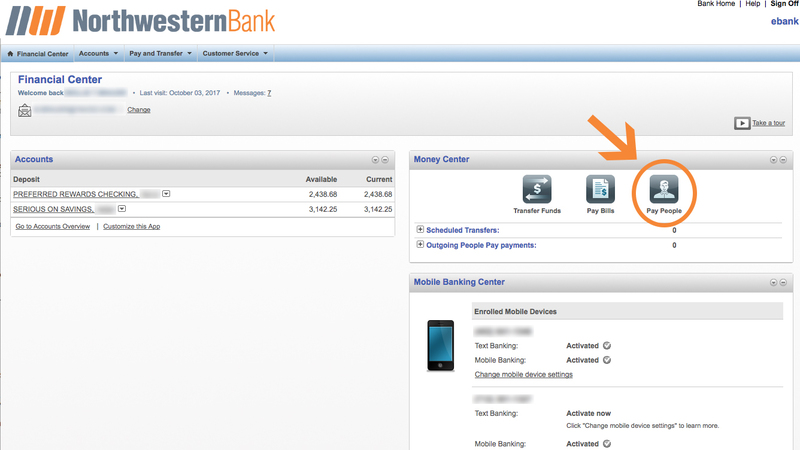 You can also activate the People Pay feature in person, with a personal banker at a physical NWB branch location. Click here to set up an appointment. How Do I Activate People Pay? 1. Log in to NWB Online Banking. If you’re new to online banking, enroll today. Or, contact us with questions or to learn more. 2. Click on the “Pay People” Icon on the upper right hand panel. 3. Agree to the terms and click “continue”. 4. Once your request for activation has been received, you will be contacted within 2 business days to verify your request for access to People Pay. 5. You will receive confirmation email when your request has been completed. Do recipients need to be a customer of northwestern Bank? No. If the recipient is not a customer of NWB, they will receive an email or a text inviting them to claim their money through a secure link. How does the recipient get their money? What if the recipient would rather receive a physical payment? You may also choose to have Northwestern Bank send a printed check — free of charge — on your behalf to a designated mailing address. Yes. Transactions are limited to the funds available in your own bank account at the time of collection. For specific transaction dollar amounts, contact NWB. WHAT IF MY QUESTION ISN'T ON THIS PAGE? For more information, or if you have additional questions, call (712) 737-4911 in Orange City or (712) 324-5141 in Sheldon, or contact Northwestern Bank online. DON'T HAVE AN NWB ACCOUNT? GET STARTED TODAY. Open a checking account online and experience better mobile banking with NWB.